Meisei’s innovative hygrometer, Skydew, will make its debut at Meteorological Technology World Expo 2019. Skydew is a specially designed Peltier-based chilled-mirror hygrometer, which does not need a cryogen material (CHF3) to operate. The use of CHF3 will be banned in the near future, making the Skydew hygrometer the logical choice for conducting environmentally sound upper-air observations. Skydew can provide accurate water vapor data for the troposphere and even lower stratosphere without emitting any greenhouse gases. In combination with Meisei’s environmental observation radiosonde, this will allow much more reliable atmospheric data to be generated for researchers. Meisei plays a key role in meteorological, seismological and outer-space observations. 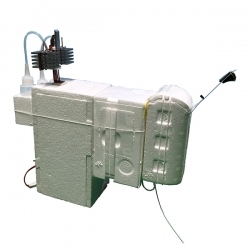 The company offers cutting-edge technologies and products with sensing and communication technologies at the core, such as its ecological iMS-100 radiosonde with sensors to detect radioactivity, CO2, cloud particles and temperature.